As of January 2015, every fire service member that is a current member of the NC State Firemen's Association is automatically a member of their respective regional association with no further cost to the member or the department. 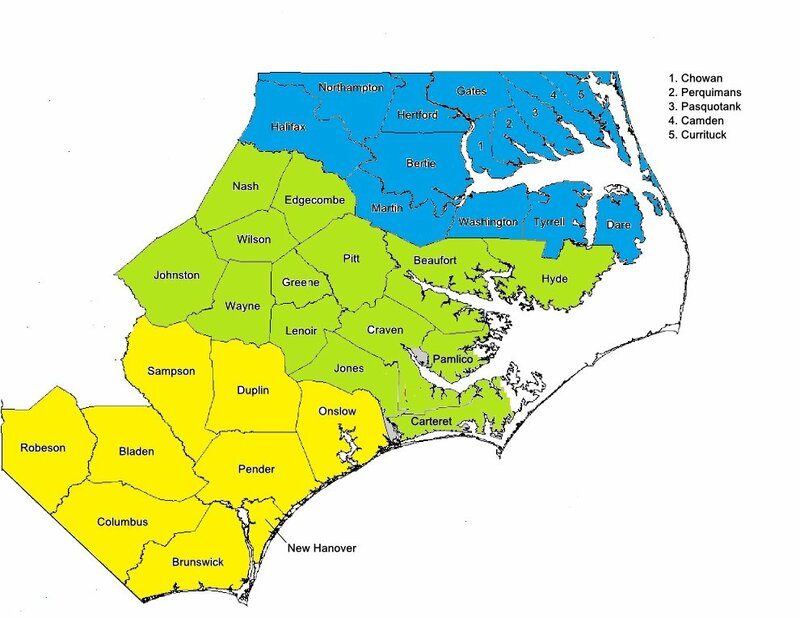 This was done in a collaborative effort between the NCSFA and the three regional association (Eastern, Piedmont and Western) to add further value and service for all of our members. Funding for each association comes from the NCSFA annual dues. For the regional associations, this meant extra income. The Eastern Carolina Firefighters Association board decided to use those funds to boost our scholarship program. We have doubled the number of available scholarships and increased funding equally. In the map below, you'll see three different geographical areas (North, Central and South) of the ECFA. We strive to serve every department in the 37 counties within our Association. There is a dedicated representative for each district, but any ECFA board member can assist you. You can find that information on our Board page. The quarterly meeting of the ECFA will be Thursday, April 11 in Clayton, NC. The meeting is hosted by the Clayton Fire Department and will be held at the Caterpillar plant, located at 954 Highway NC 42 East, Clayton, NC 27527. · Please enter the facility at the Main Entrance. You will see two machines sitting on display and several flag poles. · Proceed straight into the facility and stop at the front gate. There are two gates, please enter through the right gate. · Once you get through the front gate, please take the first right hand turn and follow the street towards the left. It will take you to a round-about parking lot. · Please park your vehicle in the parking lot at the back of the building and head up the walkway, leading up the hill. The meal will be served at 6:30 and the meeting starts at 7. There will be a brief presentation by OSFM, as well as important updates from several fire service agencies. This should be a very informative meeting. Vendors will be on hand so come early to spend some time with them. Please RSVP for meal planning to Battalion Chief Matt Sutphin by Tuesday, April 9.